I’ll take adventure however I can get it. 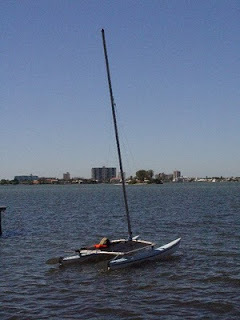 Sunday, Grant and I decided to move my catamaran to his place. The reason for this was that we could leave it in the water for some of the time and wouldn’t have to go through battling the mast every time we wanted to go sailing. We decided to do this a bit late in the day and with the time change it didn’t leave us much daylight. We got the boat out and started sailing a bit before 5, giving us about an hour or so of daylight. Note here that I’ve been sailing about 4 times in my life – I had Grant’s daughter Amber with me but she knew virtually nothing about sailing so essentially, first time alone.) Grant took the car back to his house to meet us. Well about 5-10 minutes out and I realized that I hadn’t put the plugs back in the boat before we launched. For those of you who don’t know – these plugs allow the water to drain when the boat is out of the water but obviously needs to be replace before venturing back into the deeps. So, to continue – I jumped down on the first pontoon and told Amber to just hold the tiller where it was – steady. Well, of course, the wind didn’t cooperate and just as I was reaching down it shifted the boat and I was thrown off! Now it is very hard to swim and laugh at the same time. I was swimming like a banshee and shouting at Amber to turn into the wind – it took her a minute to figure this one out. And all the while I was trying not to laugh at myself and my predicament – swimming after a sailboat. She managed to slow it down and I caught up. I screwed the plugs back in and we continued. We were having to tack back and forth a great deal because of the direction of the wind and we got to watch a very nice sunset and were getting a bit nervous about sailing the last half in the dark. We were sailing on the intercoastal so it’s pretty safe and lots of lights but none on the boat. Anyway, fate solved this one for us as well. We were sailing in toward the mainland right near the Dunedin Marina – I was just about to come about and the fastening for the tiller came off. (I promise you that I checked that and all other fastenings before we left.) It was an “Oh God” moment. But – we were aimed at the only 20 foot piece of beach on that side for 3-4 miles either way. I was able to keep us pointed to that little patch of safety. The whole thing was a total blast! 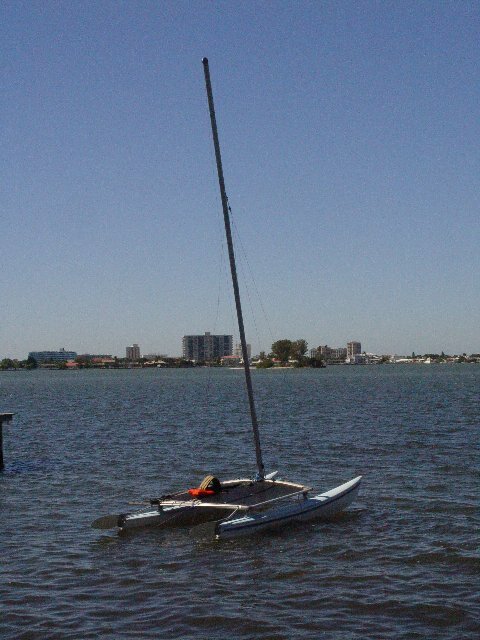 But I don’t think Amber wants to go sailing with me anymore. This did give us an excuse to go sailing Monday morning though and it really was a gorgeous day. You can see here a picture of my boat parked on the water at Grant’s place. Peter will sail with you when he comes down. He is somewhat experience but makes up for it with enthusiasm.